Ananya Chatterjea, artistic director of Ananya Dance Theatre, will speak at Crossings, a series of public events sponsored by the Mellon Summer Seminar in Dance Studies. Directed by Susan Manning, Northwestern University, the seminar will be held June 21-27 at Northwestern. 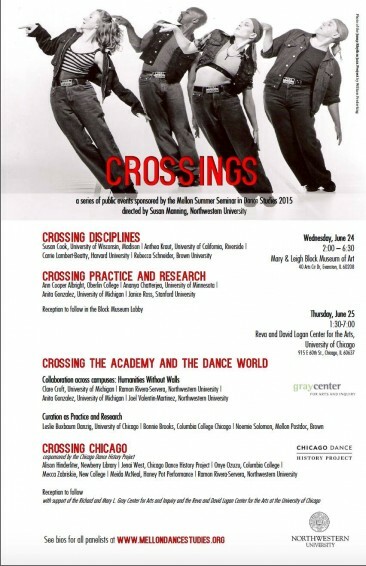 Crossings will offer four panels: Crossing Disciplines, Crossing Practice and Research, Crossing the Academy and the Dance World, and Crossing Chicago. Chatterjea, a Professor of Dance at the University of Minnesota, will join the Crossing Practice and Research panel with Ann Cooper Albright, Oberlin College, Anita Gonzalez, University of Michigan, and Janice Ross, Stanford University. Their panel will be held Wednesday, June 24, 2pm-6:30pm, at the Mary & Leigh Block Museum of Art, 40 Arts Circle Drive, Evanston, IL. The 2015 summer seminar is part of a multi-year initiative titled Dance Studies in/and the Humanities, a partnership among three universities – Brown, Northwestern, and Stanford – funded by the Andrew W. Mellon Foundation. The project has sponsored intensive, week-long seminars each summer from 2012 through 2015, and appoints postdoctoral fellows in dance studies at the three universities. It aims to develop best practices for interdisciplinary research and teaching in dance studies.